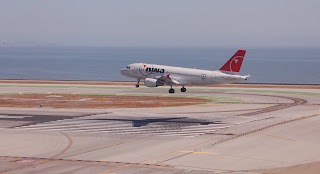 I love landing concurrently with another aircraft, and San Francisco often provides this thrill. Here, Northwest Airbus 319 N331NB lands on 28R alongside our United Boeing 757-200. Channel 9's ATC feed revealed that both planes had each other in sight, and were required to maintain visual separation for the approach.